Knitting for a Baby: Sweaters | Knit Like You Mean It. 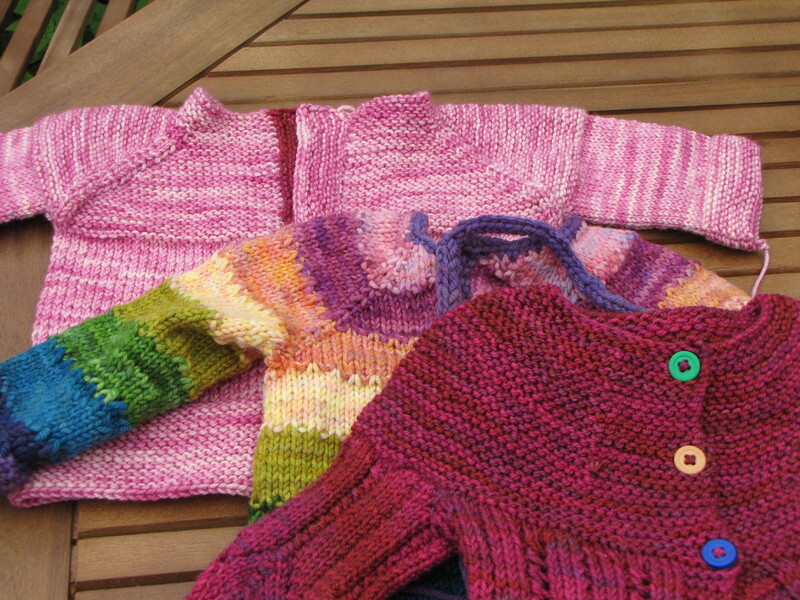 Three Baby Sweaters: from the top, the Garter Yoke Baby Cardi, the Tulips Cardigan, and the Baby Mine sweater. You all knew this post was coming: what should one knit for a baby (whether one’s own or that of a loved one)? I’ve been delving into this question a bit over the past few months, and so have some Friends of the Blog (as you have seen). Now, let me preface all this by saying that I haven’t had a baby before, and I have only occasional experience with infants. Moreover, every day that goes by convinces me that I am even less prepared to take care of a baby than I thought the day before. So what I am passing along here is the general wisdom I have read or been told about knitting for a baby. Please don’t hesitate to argue with me or to offer your experience in the comments. Today’s installment: sweaters. It’s fun and relatively easy to knit a baby sweater; since they are completed much more quickly than adult sweaters, they’re even a nice way to learn a particular sweater construction before moving on to a full-size one. Fun New Knitter Mallory is making one for her toddler niece right now. 1. Cardigans Are Nice. I am told that babies are part wiggly and part floppy, and that therefore cardigans are easier to put on and take off than pullovers. 2. Buttons Must Stay Put. Make sure that all buttons and any other embellishments are extremely secure. Babies tend to put things in their mouths, and you don’t want them trying to swallow your button. (When I first read this, I was tempted to just cut all the buttons off of everything, to be safe, but I am told that this is an over-reaction). 3. Babies Grow. So, hey, don’t feel trapped in infant sizing! You can knit something in the 6-to-12-month range and you may well see it on the recipient longer than you would a smaller garment. This is a great argument for the Rocketry and Tulips cardigans that Stephanie Pearl-McPhee made famous a few years ago. Tulips’ smallest size is 6-9 months, and Rocketry is only available in 6-9, but that size seems to me just right for a new baby. It’ll fit eventually, and (as this Knitty article) points out the baby can always wear the sweater early with the sleeves cuffed. 4. Washable Is Nice. Baby knitting seems to be one area in which the two sides of the superwash debate have come to a truce. Everyone agrees that babies are messy and new parents are busy, so superwash wool is awfully nice. Additionally, superwash wool is softer on a baby’s sensitive skin. Combed cotton is another option – both washable and soft. 5. Advanced: Babies Only See Some Colors. This is something I never, ever would have thought about, but this yahoo voices article suggests one consider the baby’s own visual pleasure when choosing colors. Infants can only see black, white, and red, the author says, so high-contrast knits will be more pleasing to them. To that end, Ann Weaver‘s fabulous Le Mans, Death Race, or Albers Baby patterns seem just right, but then how often is a baby going to sit up and say, “Hey, Mom, thanks for the aesthetic consideration!”? Consider bolder colors for your baby sweaters; nowhere is it written that a kid has to wear pastels all the time. Notice how Emily’s choice of a deep pink color modernizes the lace in her Baby Mine sweater. Want some more concrete suggestions? Here are patterns with which I have experience and which I think are worth your precious time. Pease do jump in via the comments section with your suggestions. 1. Tulips / Rocketry Cardigans. As I mentioned above, Lindsay Pensky’s patterns in Dream in Color yarn rose to fame when the Yarn Harlot confessed her addiction to the Tulips cardigan. You can get kits for these top-down striped sweaters through Coldwater Yarn – convenient if you don’t want to buy a million little skeins of yarn. I’ve made these for friends over the past few years. The “wow” factor is pretty high with these. Plus, Dream In Color Classy is fabulous to knit with. Mmmmmmm. I have yet to decide whether the adult version would be attractive or too much on me, but I am definitely tempted by it. 2. Yoked Cardigan. This easy top-down sweater was my go-to before I started on the Dream in Color sweaters. Hannah Fettig designed this sweater in many sizes from baby to adult. It’s a quick and easy knit. The smaller sizes seem to have larger sleeves (proportionally), but that may well make it easier to get a baby’s arm through said sleeve. This might make a great practice top-down sweaforked you haven’t knit top-down before; make a baby one as a gift, then reward yourself with an adult size for you. 3. Garter Yoke Baby Cardi. I just made this using the pink yarn that Emily sent me. Again, it’s a top-down pattern – but I’d suggest not making this as your first top-down sweater, because the instructions require some understanding of the top-down construction so that you don’t get lost. The pattern only comes in one size (6-12 months), but it’s a free pattern. Overall, worth a try! 4. Owlet. 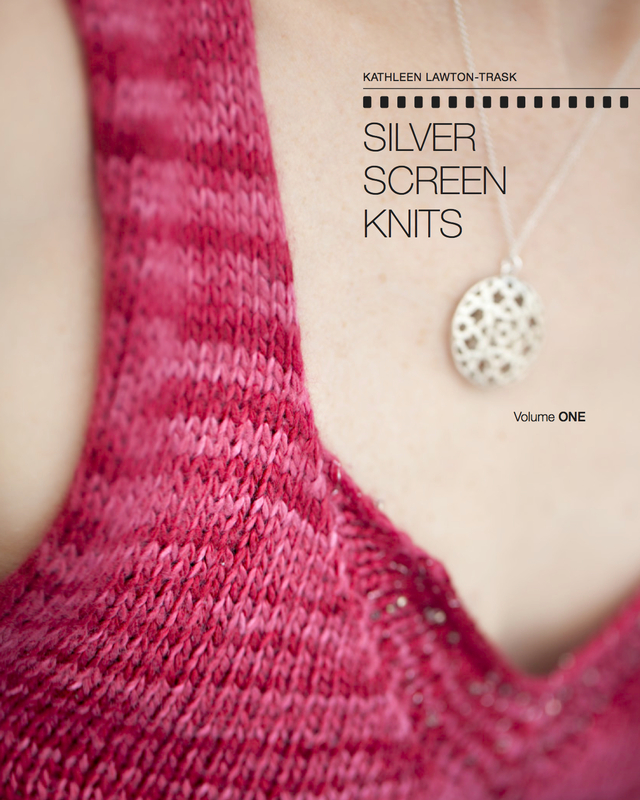 Popular a few years ago and written by knitting master Kate Davies. I am about to cast on for this one with yarn I got through Sophie at Twist Yarns. Cannot wait to make the cute little cabled owls. Less enthusiastic about sewing like 20 buttons on for the eyes. But, hey, I am brave. If the little sweater goes well, I may try for a bigger one for myself. You know, in my spare time. 5. Tiny Tea Leaves. Mallory’s making one if these for her little niece, and the pattern is well-written enough that she hasn’t needed a lot of help. Plus, this pattern looks great in variegated yarn as well as solid. Just for kicks, I gave the Garter Yoke Baby Cardi one contrasting button band, and made a coordinating hat out of the extra yarn from Baby Mine (which Emily-the-knitting-enabler sent along with the completed sweater). Here are some patterns that have been suggested to me, but that I haven’t tried yet. If you have experience with them, jump on in and let us know! 1. Olearia. 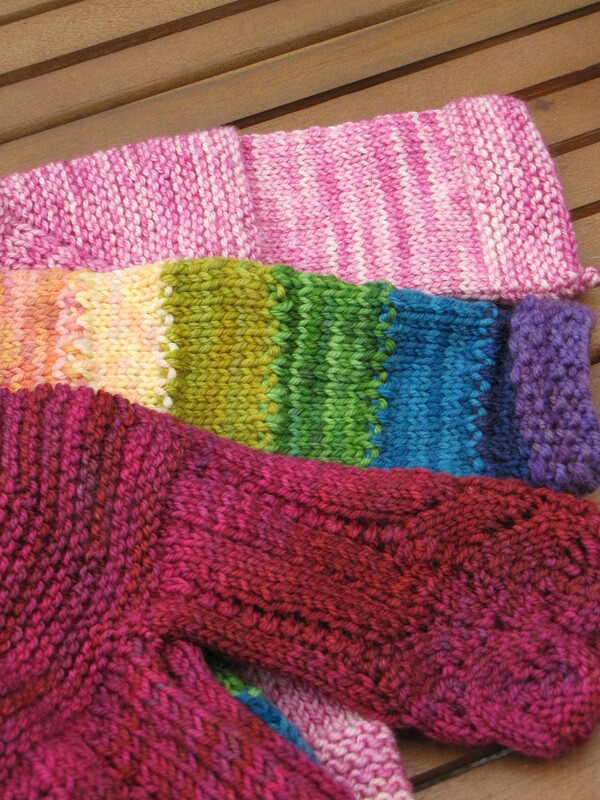 In similar vein as Tiny Tea Leaves, with garter stitch ridges, but several different style options. 2. Milk Infant Top. The fabulous Lesley suggested this a while back, and the only thing that’s kept me from knitting it is not having quite the right yarn. Somehow, this feels like an heirloom pattern, with its crochet edging, and I’m not sure I have any heirloom yarn in the right weight. 3. Baby Mine. A Yarn Harlot pattern, this one was knit for our kid by fabulous Emily. It’s beautiful – a real heirloom piece – and (again) has a lot of “ooh” potential. I know I oohed when her mother gave it to me! 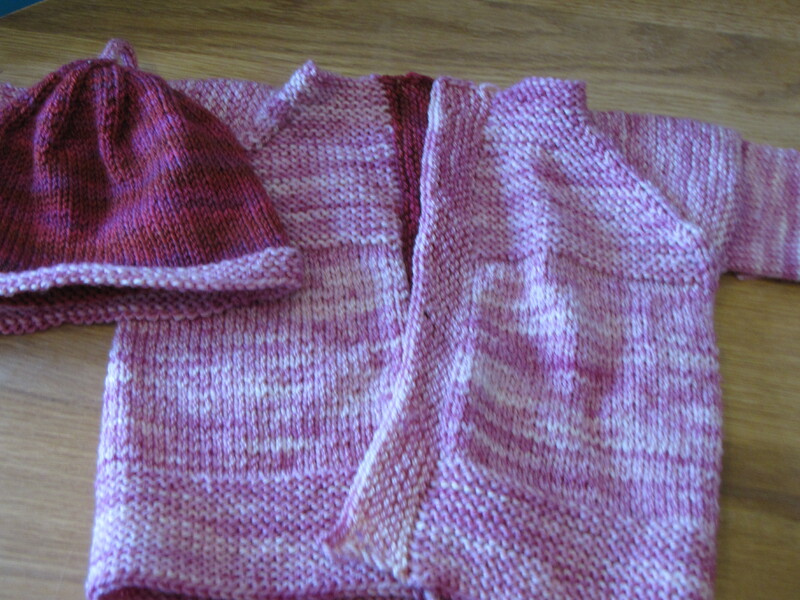 Emily knit this in a deep pink color, which makes the lace on the bottom and the sleeves look modern. 4. Demne. A really pretty cardigan, knit side-to-side. Free pattern, but sadly only available in one size: 0-3 months. 5. Eyelet Yoke Baby Cardigan. Cute but not too fussy. 6. Sunnyside Cardigan. Cute, cabled, free, available in many sizes! This one’s high up in my queue. 7. Seamless Baby Kimono. There’s a whole host of baby kimono patterns on Ravelry; this is the one that was suggested to me, and it looks lovely. Garter stitch, seamless, lots of sizes. Do you have a go-to baby sweater pattern? Share it with us in the comments! These are lovely. I love the bolder shades! Knitting a baby blanket for her is like bringing coals to Newcastle, but it is almost done and I am having great conversations with “Little Miss feisty” while I knit! Uh oh. I see you have PLENTY of baby sweaters…gulp! I didn’t quite finish the comment – my phone’s not great for commenting on blogs! I will blog the knitwear as the little one grows into them – the rate she’s going it won’t be very long! I’m on the look out for knitted dresses for the winter now, and something sweet to use my King Cole Galaxy for her.